Here is a simple game for all my fellow calculus teachers. The categories are integration, definite integrals, substitution, the fundamental theorem, and area between curves. Play it with two teams in "regular" or "double the points" mode! How to play: Pick a team at random to go first. 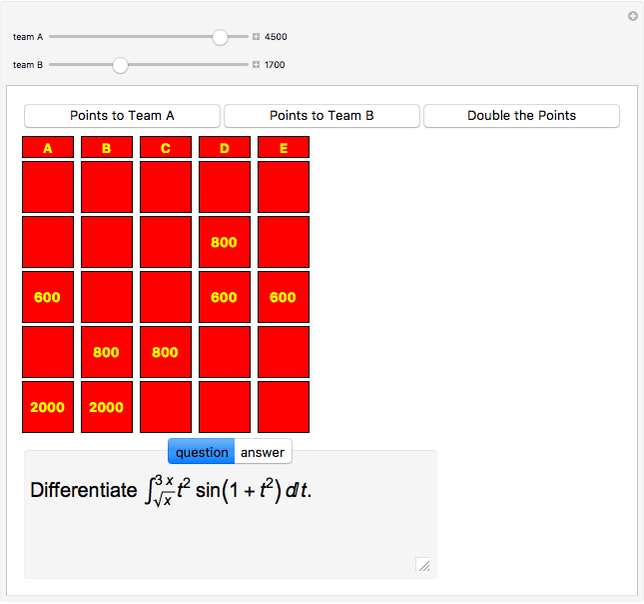 That team gets to choose a category and a point value. Then the teacher clicks that specific box and the question appears in the text field. Both teams can try to answer the question, and if the first team to respond gets it wrong, the second team can venture a guess. I usually limit each question to a certain amount of time. Whichever team answers correctly gets to choose the next question. If no one gets the answer, the same team as before gets to choose the next question. Once you get though most of the questions and want the students in the losing team to try harder, switch to double-point mode to make things more exciting. Whoever has the most points at the end of class wins!